Finger food goes Paleo! If you’re feeling nostalgic for a crispy fried treat, whip up a batch of your own chicken nuggets, and enjoy a classic favorite made healthy. 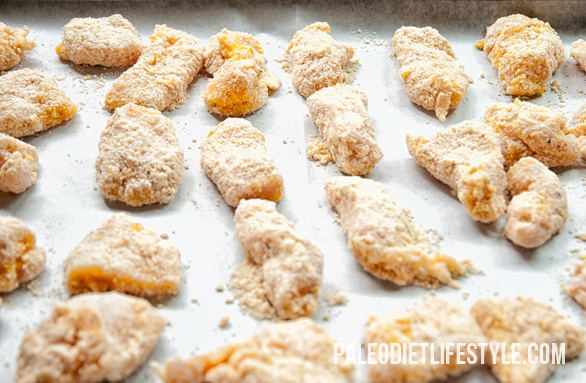 Chicken nuggets don’t make for the most nutritious of Paleo dinners – for one thing, they use a lot of nut flour – but they’re fantastic as an occasional treat that will leave kids everywhere begging for more. If you need a guaranteed crowd-pleaser for a birthday party or special occasion, you’re definitely in the right place. As well as the health benefits, another advantage of DIY nuggets is the power to change the flavor exactly to your taste. Play around with different spices or even ingredients. Here, I made a very flavorful version with a lot of spices, but you don’t have copy this exactly. 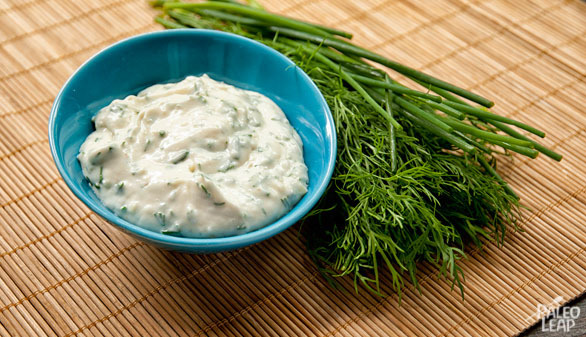 I’ve also included a recipe for a dill ranch sauce, but this is optional as well. If you prefer, you can substitute barbecue sauce, plum sauce, honey-mustard sauce, or whatever else you like. For a real fair-food bonanza, serve up your nuggets and your sauce of choice with a side of sweet potato fries (or this spicy variation), and invite over your neighbors to help you celebrate the last of the warm weather in style. Using a rolling pin or meat hammer, flatten the chicken breasts to an even thickness. Cut the chicken into bite-size nuggets. In a bowl, combine the coconut flour, almond flour, garlic powder, paprika, oregano, and salt and pepper to taste. Mix well. In a different bowl, break and whisk the eggs. Dip each chicken piece in the whisked eggs, then coat evenly with the flour mixture. Line up all the nuggets on a greased baking sheet. When all the nuggets are coated, bake them in the oven for 10 to 12 minutes, turning them over around the 5-minute mark. While the chicken nuggets are cooking, combine all the ingredients for the dill ranch dip in a small bowl. Season to taste and whisk well. 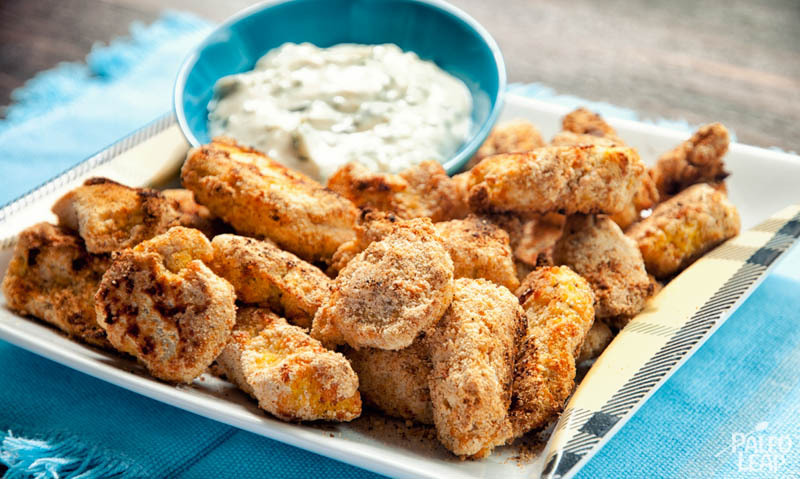 Serve the nuggets with the dill ranch dip.